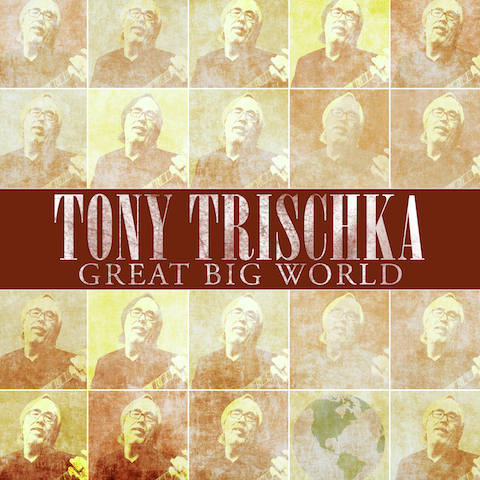 Tony Trischka, widely regarded as the most innovative banjoist of his generation, will release his 17th solo album, Great Big World, on 4th February 2014 on Rounder Records. Trischka’s instrumental expertise and boundless imagination are as sharp as ever on Great Big World. One of the most ambitious and accomplished of the artist’s career, the 13-track set is a deeply compelling showcase for his expansive instrumental talents, far-ranging musical interests and distinctive songwriting skills, as well as his sterling taste in collaborators. Great Big World’s stellar cast includes such longtime compatriots as fiddler Mike Barnett, mandolinist Mike Compton, singer-guitarist Michael Daves, and bassist Skip Ward. The album also features such notable guests as Steve Martin, who trades banjo licks with Trischka on the scintillating instrumental “Promontory Point,” which they cowrote (Trischka produced Martin’s Grammy-nominated 2011 album Rare Bird Alert); alt-bluegrass legends Andy Statman and Russ Barenberg, whose associations with Trischka stretch back to the beginnings of all three musicians’ careers; Punch Brothers/Leftover Salmon banjo prodigy Noam Pikelny; legendary folk troubadour Ramblin’ Jack Elliott; actor John Goodman; acclaimed roots vocalists Aoife O’Donovan, Catherine Russell, Abigail Washburn and Chris Eldridge; and a one-off electric combo comprised of Bob Dylan/Levon Helm guitarist Larry Campbell, Allman Brothers Band bassist Oteil Burbridge and Trischka’s son Sean on drums. Trischka’s readings of the Stephen Foster chestnut “Angelina Baker” (sung by Michael Daves and Aoife O’Donovan) and the Woody Guthrie standard “Do Re Mi” demonstrate his fluency with traditional American forms, as well as his ability to infuse those forms with his distinctive sensibility. The artist’s own inventive songwriting is showcased on such original instrumentals as “The Danny Thomas,” “Ocracoke Lullabye,” and the playfully ambitious “Single String Medley,” which incorporates five new original tunes, each written for a different banjo string. Trischka delivers a stirring solo performance on his album-closing “Swag Bag Rag,” written in the style of turn-of-the-century parlor music. Pretty much all of the old barriers are broken down now, so it doesn’t feel like a fight to create what you want to create. Even when I’m playing weird modern things, I’m still rooted in Earl Scruggs, but there are just so many more things you can do and so many options to explore. I just think of it all as being part of the whole continuum. I think it’s important to hold onto the roots, but I also think that the possibilities of banjo are endless, and that’s what keeps me going – Tony Trischka. Several Great Big World tunes demonstrate Trischka’s knack for penning deeply evocative lyrics, as on the heart-tugging album-opener “Say Goodbye (for KM),” a fond tribute to the late singer-songwriter Kate McGarrigle. Meanwhile, his haunting “Lost” is graced by strings, woodwinds and Abigail Washburn’s affecting lead vocal. The wistful “I Wonder Where You Are Tonight” is a song by Johnny Bond, which Trischka first heard on a bootleg tape of a live Bill Monroe performance. The album takes an uplifting electric turn on the Trischka-penned “Joy,” on which Catherine Russell’s soulful vocal breathes vibrant life into a lyric whose verses were adapted by Trischka from, respectively, Buddhist, Christian and Jewish texts. Perhaps Great Big World’s most audacious creation is “Wild Bill Hickok,” a widescreen old-west mini-opera that features a vivid lead vocal from Ramblin’ Jack Elliott (who called it the hardest song he’s ever been called upon to sing), supple additional vocals by Mike Compton, and a dramatic reading by John Goodman, which adds to the song’s emotional gravity. The confident mastery and boundary-breaking creative spirit that drive Great Big World have been consistent hallmarks of Tony Trischka’s long and prolific career.